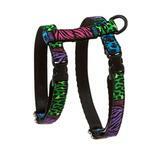 Keep your kitty safe and styling with the Back to the Wild Cat Harness by RC Pet Products! Cats on the go need to be secure, but there’s no reason they can’t be stylish, too! Believe us, this harness is easy to put on your cat and fully adjustable. Machine wash cold on delicate cycle. Do not wash with touch fastener items. Hang to dry. Do not iron, do not bleach, do not dry clean. If needed, pre-soak in an enzymatic cleaner like Nature's Miracle. Matching leash sold separately. Small: Chest 9-14" Neck 8-10.5"
Large: Chest 12-20" Neck 9.5-15"
Chunky: Chest 14-25" Neck 13-22"
Posted On 02/27/19 by J.A. G from Chicago, IL Yes, J.A. G recommends this product! On/off w/double snaps...particularly good 4 cat use! Posted On 10/20/15 by Jacquelynn B from Bush, LA Yes, Jacquelynn B recommends this product! I have an 18 lb cat that I am unable to lift and carry in his carrier to the vet. Now I can harness walk him to the car, put him in his carrier, and the vet techs will carry him in for me. It is ESSENTIAL that he not roam free as coyotes are in the area. They do feed in daylight, as well! This harness just fits his large chest. Perfect! Posted On 06/27/15 by Cynthia M from Fridley, MN Yes, Cynthia M recommends this product! This was my second try on size. It is a little narrow for my fat cat, but love it anyway, and she doesn't try to take it off. 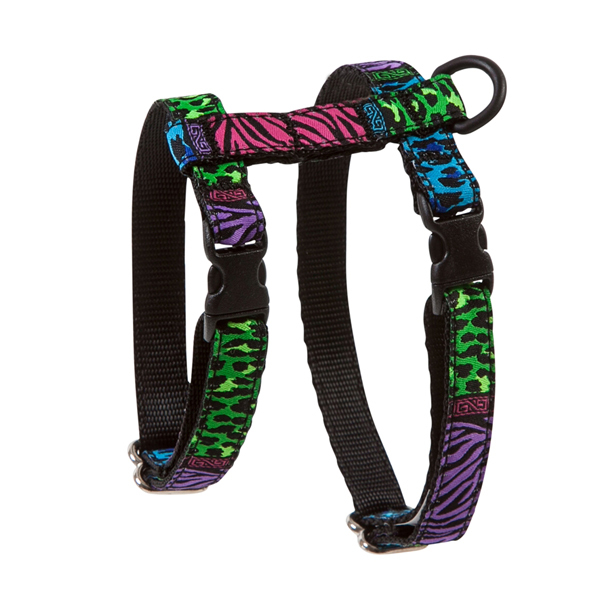 Love this Wild Cat Harness! Posted On 12/01/14 by Janis S from Baltimore, MD Yes, Janis S recommends this product! My kitten loves going out with his harness on instead of being stuck in a carrier! This harness is sturdy while being stylish! So happy I stumbled upon this website! I needed a very specific item for my pups Halloween costume and BaxterBoo had exactly what I needed.